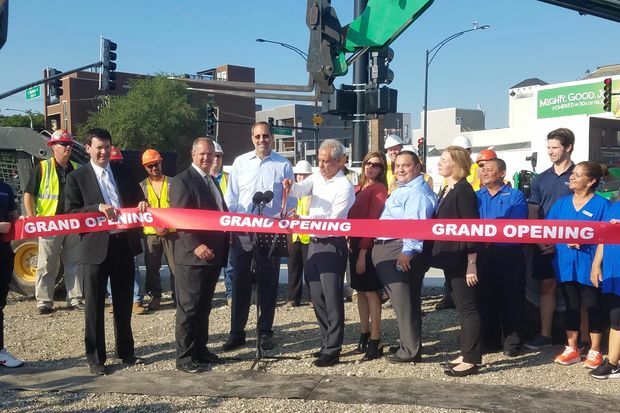 BUCKTOWN — After two years of construction, a $22.5 million reconfiguration of the oft-clogged Damen, Elston and Fullerton intersection is complete, city and state officials said Monday at a celebratory gathering. "Today, we cut the ribbon on four or five decades of bottleneck," Mayor Rahm Emanuel said at the intersection, which sees 70,000 cars pass through daily and is one of Chicago's most congestion-plagued traffic hot spots, according to the city. Emanuel was joined by Chicago Department Of Transportation Commissioner Rebekah Scheinfeld, Illinois Department of Transportation Secretary Randy Blankenhorn, 2nd Ward Ald. Brian Hopkins and a host of workers from Midtown Athletic Club, a private sports complex affected by the construction. Formerly a three-way intersection, Elston Avenue was rerouted around the intersection. Work began in the summer of 2015. Waits to make a turn at the intersection were as long as seven minutes, city officials said back in 2011, when the reconfiguration was announced. Scheinfeld described the reconfiguration as "transformational." "It's no secret that this used to be one of the most crash-prone and frustrating, congested intersections for daily residents or people coming though on an irregular basis," Scheinfeld said. The fix has reduced travel times and driver frustration. The project realigned the intersection by building a new section of Elston Avenue that connects to Fullerton Avenue east of the original intersection. The realignment allows southeast bound Elston Avenue traffic to avoid the Damen and Fullerton intersection, significantly reducing congestion. The new stretch of Elston Avenue includes two through-lanes for car traffic and protected bike lanes in both directions. Improvements also include the resurfacing of all streets within the project limits, widening Damen Avenue to improve traffic flow and better accommodate bikes, and widening the north sidewalk on Fullerton Avenue. Emanuel, who thanked "impacted business" and motorists for their patience during the construction, called the project "a win-win," saying it created jobs and improved traffic flow. Some 162 new trees will be planted along the intersection this fall, Michael Claffey, a CDOT spokesman, said. Claffey said 50 of those 162 new trees already have been planted. The old section of Elston Avenue south of Fullerton Avenue was renamed North Elston Court and has been reconstructed with access at Fullerton, and with "bumpouts," or parts of the concrete sidewalk pushed out — to protect pedestrians and slow down vehicles, Claffey said. The project also created room for commercial development on both the north side and the south side of Fullerton east of Damen Avenue. Vienna Beef relocated its plant to Bridgeport because of the construction and wants to bring a grocery store, shopping and dining complex to its former factory. The massive intersection remake required the city to execute eminent domain for properties that were demolished because the newly rerouted Elston Avenue runs through the sites. Whirlyball moved to a larger facility at 1823 W. Webster Ave. and a Dunkin Donuts building was demolished and not replaced, among other changes. "Forward-thinking improvements and investments like these will continue to strengthen our infrastructure and improve the lives of those who call Chicago home," said Rep. Mike Quigley (D-Chicago) in a prepared statement. The $22.5 million construction cost was paid for through federal, state, and local funds and was managed by CDOT in coordination with the Illinois Department of Transportation.